Assorted Notions: Bunka - in English! Major news for English speakers who love Mrs Stylebook (MSB), or those of us who want to love it but are stymied by the pattern drafting illustrations. 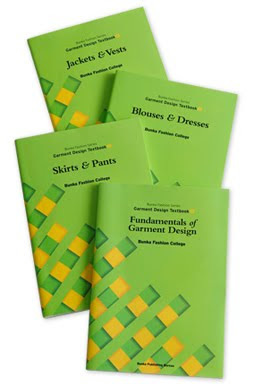 The Bunka Fashion College has published their Fashion Course textbooks in English! I ran into Kinokuniya last week on my way to lunch. I try to hit it up every month or two - now that I've learned to steel myself against the display of adorable craft books - just to keep my finger on the pulse of the Japanese crafting world. A big green book caught my eye, and since there was no cute picture on the cover, I knew it must mean business on the inside. Sure enough... it was Bunka Fashion Series Garment Design Textbook #3 - Blouses and Dresses. My heart started racing, literally! I flipped through it and bought it without really knowing what it was, just that I needed it. The technical drawings that are so abundant in MSB and also prevalent in the textbook, but there are also fashion sketches to show various blouse/dress styles and photographs to demonstrate various sewing techniques (all in black & white). Here's what I think is one of the best features of this book - they show you how to make a sloper! They say the sloper can be drawn with just 3 measurements: bust, back length, and waist. From what I understand (correct me if I'm wrong, Diana), the Bunka/MSB sloper has some ease included, unlike the very fitted sloper that we usually think of. So if you want to use the MSB patterns, it's key that you start off with their sloper that includes ease. The ISBN for Blouses & Dresses is 978-4-579-11240-1, and the books are selling for US $44.80 at Kinokuniya. This is awesome news, which will assuredly take our sewing to the next level. Thanks for sharing! I have never heard of these, but I am still excited!!! I am going to check these out. I will definitely check these out. I wasn't able to go to Kinokuniya's today. But I put in the word to Mr Geek Sewing, and he will definitely try to work our schedule to make room for Kinokuniya next weekend. Yes, the sloper can be drawn with three measurements. Some may encounter a few problems; however, Christina, I don't think you will have a problem drafting yours. I'm going over to my blog to blog about your blog. I saw this book at my local Kinokuniya. Good thing they didn't have the Blouses & Dresses edition, otherwise it's another $45 spent out of budget. Oh my, what a find. I love so much of what I've seen of MSB, but really been unwilling to figure it out without any English. Keep us apprised of your journey. Love it! I actually have this pattern and probably have some fabric already to make this. I'd love to play in a cardigan sew along! Not that I need one more pattern making book, but these sound very tempting. Thank you for the tip. ordered them!! thanx for the head's up! Hello. I followed Cidell's suggestion and found your blog. Went to amazon.com/jp to see if I could get at least one book. It's all in Japanese (no surprise). How does one get an english translation? hey, i was just browsing the internet for pattern making books! but i only find thousands of books for womenswear, so my question is does the series also eplain menswear?? like in the jacket and vests series or pants series?..